Situated on one of the most spectacular cul-de-sac lots in the estates at bay colony golf club providing privacy, southerly aspect and magnificent water and golf course views, this impeccably presented home is designed for todays living with its unique transitional style and architectural flair. Ideal for entertaining, this kurtz crafted 10,000 sq. Ft. , 6 bedroom home affords formal dining and living rooms, a gourmet chef's kitchen which is a delight for the culinary enthusiast and leads to an oversized breakfast area and separate family room. Additional features include self-contained separate guest quarters over the 3-car garage, a custom designed library and a large 2nd-floor entertainment room with custom built-ins. The outdoor living space is outstanding, with custom designed pool and spa, gazebo with summer kitchen, full pool bath and a large 1st-floor electric screen lanai together with an expansive 2nd-floor terrace with electric awnings providing magnificent views of the immediate surrounds. 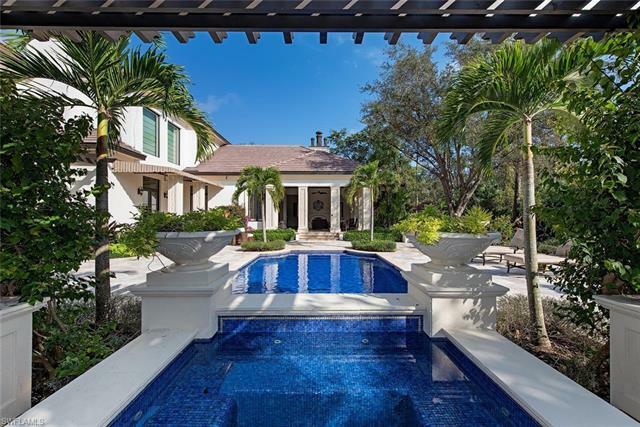 Located within one of the most prestigious golf course communities in naples, this offering includes a private membership to the exclusive bay colony beach and tennis club. H. 12437 - stunning palatial residence, in the heart of naples. Everything you could want in a home, and more. With 5 bedrooms, 7 full bathrooms, 3 half bathrooms, library, game room and theater, encompassed within 9,044 sq. Ft. Of the finest craftsmanship. The curb-appeal alone, will make you the envy of the neighborhood. The entry into the 23 ceiling grand salon will impress all of your fortunate guests. And the oasis pool with its koi pond and lake & golf course view is unforgettable. The finest appointments are showcased in every inch. From custom crafted cabinetry, imported stone floors and countertops, intricate millwork, state of the art electronics, exquisite fixtures, stone hearth fireplaces, and much moreits everything you deserve. Immediate golf membership available. This custom estate home situated on an oversized 1. 34 acre home site in il corsini at mediterra was built by kurtz homes with a perfect combination of superior quality, elegance and comfort. A rare 300-foot driveway brings you to a gated motor court with a 5-car garage. New exterior paint completed december 2018 and main interior living areas painted february 2019. Previous $400k of renovations included new landscaping, pool, spa with pergola, water feature and decking in 2016. Among the many features of this home are a gourmet kitchen, two fireplaces, electric outdoor screens inside the columns, a mahogany paneled study. The expansive recreation room features billiards and a tiered 14 seat home theater. Guests can enjoy extra privacy in the detached cabana suite with separate entrance, living room and full bath. The outside entertainment area takes full advantage of the long golf course views. The exclusive mediterra golf & beach club offers multiple levels of membership. Phase 1 of the renovated club house was finished december 2018 and phase 2 will be completed summer 2019 with no assessments to members. Buyer to assume cdd. Welcome to the ritz carlton golf resort lifestyle featuring 36 holes of championship golf, tennis, fitness center, intimate club house and hotel amenities. Within minutes to beaches, upscale shopping, restaurants and the performing arts. Located in the exclusive gated community of escada at tiburon, this luxurious estate home was constructed for the discriminating buyer who appreciates quality and attention to detail. The exquisite finishes are beyond comparison as no expense was spared in creating this private sanctuary. The gourmet kitchen and walk-in wine room adjoins the family room, which opens onto an expansive terrace, outdoor kitchen, wet bar, infinity pool, spa and spectacular golf course views. The perfect venue for entertaining family and guests. The separate guest house constructed in 2010 offers complete privacy. Two temperature-controlled garage structures accommodate up to six vehicles - a must have for the car enthusiast who wants all automobiles on site. This timeless, magnificently-appointed home must be seen to appreciate the custom details in each space. Click on the virtual tour you-tube video link to see this extraordinary property!